UHV Contamination Test Hall | Research & Development | NGK INSULATORS, LTD.
UHV Contamination Test Hall Dimensions of fog room:30m x 25m x 30m h.
Electromagnetic shielding effect:65dB at 1MHz. Fog generating equipment:6ton/hr. boiler and spray nozzle in total 150 in 4 different directions. 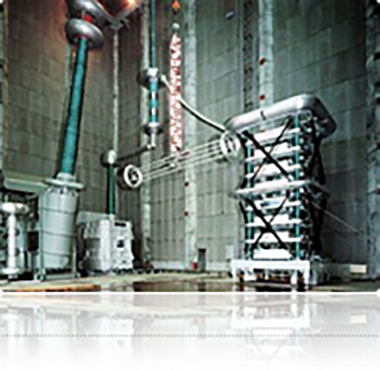 AC 1000kV Contamination Test Facilities Testing transformer:1000kV, 5000kVA/ 1 min, 4000kVA/ continuous. Voltage drop of the total system:Less than 5% at 3A, 600 - 1000kV. Power Source:Short circuit generator (3-phase, 125MVA). DC 750kV Contamination Test Facilities Type:Cascaded three phase full-wave rectification with feed-back system. Voltage drop of the total system:Less than 5% at 2.5A, 200 - 750kV.